For a moment, and we’re talking about a long, throbbing moment, Our Beloved Ranch Wife couldn’t believe what had happened. She stared at the cat, her eyes filled with hurt and shock, while the villain gave her a sultry, pouting glare. But as the seconds passed, the truth began to soak through the coffee filter of her mind. She had just been clawed by her own precious kitty. When I heard the whistle of air rushing into her lungs and saw the flash of lightning in her eyes, I had a feeling that kitty was fixing to get some schooling on whom to scratch and whom never to scratch. He did. She snatched him up by his tail. “Don’t you ever scratch me again, you ungrateful little heathen!” Then she gave him a toss. I was stunned. Astamished. Amazed. Never in my wildest dreams had I thought that I would live to see the day when she would call her cat exactly what he was, an ungrateful little heathen! And then give him a toss! Oh, this was wonderful! I rushed around the back of the car and began pumping out Barks of Applause. Little Alfred, a normal, wholesome child, had reacted just as I had. He thought it was the funniest thing he’d ever seen, and he was laughing his head off. Sally May whirled around to him and gave him the Cobra Eye. Do you suppose the ungrateful wretch came out of the bushes and tried to make peace with the woman who, for some weird reason, cared about him? Oh no. He saw this as a perfect opportunity to sulk and feel sorry for himself. She opened the car door and lifted Molly out of her seat. The baby had slept through the whole thing, missing the best show we’d had in years. Sally May told Alfred to start bringing in the groceries. “I’ll put the baby down and be right back to help. And don’t you dare be mean to the cat.” She went into the house. Right, I thought it was hilarious, but it would have to be one of those secrets that dogs and little boys share in private. We had a special bond, don’t you know, and it was built on a firm foundation: neither one of us had any use for a cat. Alfred fetched a bag of groceries out of the back of the car and started for the house. It was pretty heavy and he had to struggle to carry it. By the time he made it to the porch, he had to stop and rest. Setting the bag on the porch, he looked toward the house. Oh. Well, those things happen. The boy glanced around, suddenly bored, and spied his toy bulldozer lying in the yard. He went to it, dropped down on his hands and knees, and started pushing it across the frozen grass. Moments later, the air was filled with the sputtering sounds of a D6 dozer, building a new road through the yard. “Never mind.” I pushed him out of the way and stormed over to the car. Sure enough, someone had left the back door open (we needn’t name names, but you and I know who did it), and sure enough, there was a cat inside one of the sacks of groceries. It was Pete, and would you like to guess what he was doing? With his switchblade claws, he had ripped a hole in a plastic bag and he was in the process of eating Sally May’s bread! He ignored me and kept right on eating. Oh, and you know how cats sometimes yowl when they eat? That’s what he was doing, yowling and stuffing his face with bread. You probably think he jumped inside the car and took care of business. Ha. He staggered three steps to the side and collapsed, and we’re talking about falling like a bad load of hay. My mind was tumbling. We had lost half our troops. The moans of the wounded filled my ears. What to do? Then it hit me, and we’re talking about a stroke of genius. 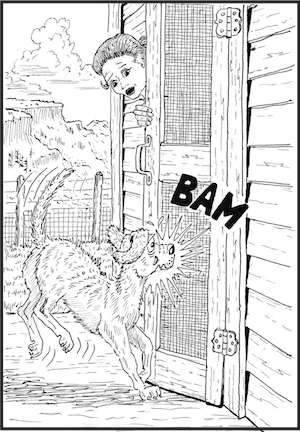 Instead of making a frontal assault, we would bark the alarm, alerting Sally May to the fact that her little crook of a cat was stealing bread. Was this a great idea or what? It was perfect, brilliant. See, this kind of thing had never happened before, kitty daring to rob groceries from innocent women and children, and doing it in daily broadlight. For years, he had managed to fool the general public and had keep his true, corrupt nature a secret. Now he had given me a perfect opportunity to blow his cover and show the world what a rotten little creep he really was. Sally May needed to know the truth about her cat, and she needed to be the one to drop the hammer on him. Hee hee. I could hardly wait. In making a dash to the house, I figured I would have to climb over Drover’s potsrate body, only it wasn’t there. Someone had moved it or…the little slacker! While I was occupied with other matters, he had highballed it to the machine shed. Oh well, I didn’t have time to deal with Drover. I sprinted through the yard gate (Alfred had left it open, of course) and rushed to the porch. There, I went into the Barking Stance (all four legs securely braced on a solid surface), loaded my lungs with a huge supply of carbon diego, and launched a barrage of Alert and Alarm Barking. Oh, you should have been there to hear it. We’re talking about thunderous barks, barks that rattled windows and shook the house to its very foundations. There was no way she could ignore such an amazing display of barking. Sure enough, the door opened and her face appeared on the other side of the screen door. She looked mad. Good. She was fixing to be a whole lot madder—at her thieving little kitty. We hope you enjoyed this snippet from Hank #66! Be sure to let us know what you think in the comments section below. AND, keep your eye out for upcoming contests and giveaways!